BASSETERRE, St. Kitts — Residents in Molineux and surrounding villages can now enjoy dental and 24-hour EMT/Ambulance service at the Mary Charles Hospital, thanks to the recommissioning of these services as a part of a government mandate to fulfill goal number three of the United Nations Sustainable Development Goals (SDGs) on improving family health. The ceremony took place July 31 at the Mary Charles Hospital in Molineux. Minister of State with responsibility for Health, the Honourable Wendy Phipps, said that the community and institution-based health services need to work hand-in-hand to improve the overall standard of living for citizens in the Federation. Minister Phipps added that the reintroduction of the EMT/Ambulance Service will be an enhancement of what previously existed, creating a quicker response time to emergency care island wide. She also said that the opening of the dental clinic will alleviate the pressure from the Pogson Medical Centre in Sandy Point, which is temporarily the primary public dental facility due to the temporary closure of the Newtown Dental Clinic. 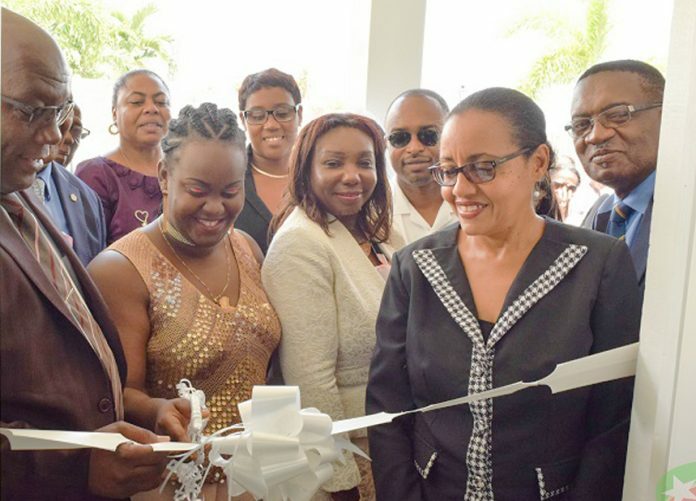 Minister of Health, the Honourable Eugene Hamilton, while adding his thoughts about recommissioning important hospital services, said the new Dental Clinic and relaunched EMT/Ambulance services will allow increased care for the residents in the local community, especially to those who are in need. “This is a time for celebration because the Team Unity Government is delivering on another strategic promise outlined in the National Strategic Plan for health as it embraces the United Nations Sustainable Development Goal number three: family health, good health and well-being,” Hamilton added. He said these renewed services will provide a disciplined and organized system with equipment, expertise and experience in emergency intervention, which will allow a timely response for the healthcare professionals to address medical emergencies. The minister congratulated health-care practitioners and professionals for the tremendous strides being made in the Federation and pledged the government will continue to support the efforts to improve the overall health of the nation, specifically with disease prevention. The enhancement project on the Mary Charles Hospital stated in 2015 with the hospital renovated and reopened in 2016. Now the new Dental Clinic and EMT/Ambulance Services have been added. The ambulance was obtained with the assistance of the St. Kitts and Nevis High Commissioner to London, His Excellency Dr. Kevin Isaac, who with assistance from other parties abroad, facilitated the handover of two ambulances to the Federation.